← Any Mummers ‘lowed In? and 5th Annual Mummer’s Walk Announced! The Great Northern Peninsula continues to showcase the many talents of the people with connections to this place we call home. Gina Noordhof, has spent her lifetime involved in the tourism and hospitality industry from the early years of helping her mother, Bella at the Vahalla Lodge B&B in Gunner’s Cove. As the youthful age of 21 she established the Norseman Restaurant and Gaia Art Gallery at L’anse aux Meadows, which is home to North America’s only authenticated Norse site, which has been given World UNESCO status. I’ve been impressed by Noordhof and the quality experience she is able to provide visitors at her fine dining restaurant, nightly entertainment, traditional artworks and unique lodging of heritage home rentals or a bed and breakfast experience. 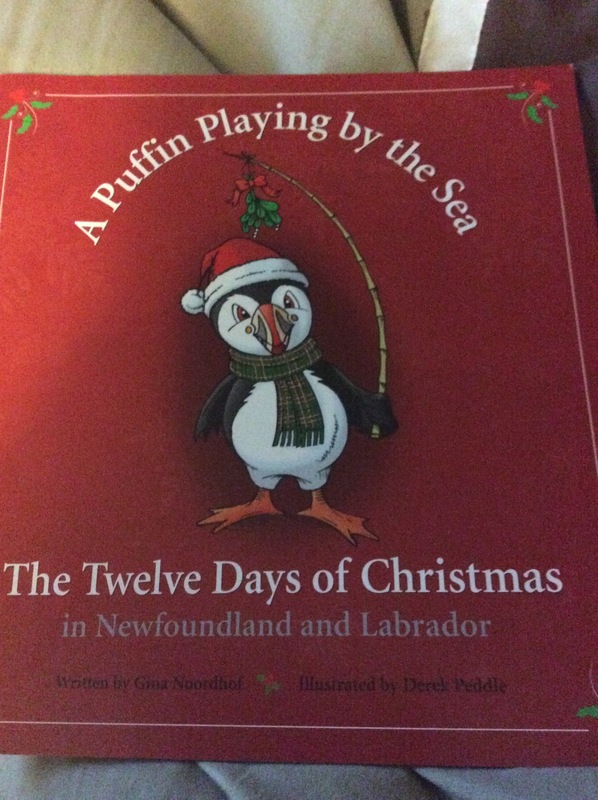 During a visit to her restaurant early this summer, an employee showed me a copy of her draft version of her book “A Puffin Playing by the Sea” – The 12 Days of Christmas in Newfoundland & Labrador. I was greatly impressed by the creativity of utilizing our provincial bird to create a character and illustrate the carol with local icons such as the mummers, norse, lighthouses, seals, fiddles and more. The book provides a perfect balance for the child as a keepsake of Newfoundland & Labrador to be captivated by the illustrations and authenticity of our traditions, culture, heritage and history. As well, the columns to the right provide details and images that would appeal to adults and give insight to who we are as a people and a snapshot of the past, as well as showcase our unique nature and natural beauty. Gina’s involvement with the Canadian Tourism Commission Board has certainly proved beneficial as she shared her knowledge and experience but also saw an opportunity to create a series of books. Her first focuses on Newfoundland and Labrador, but she plans to replicate this concept across all provinces. It is a wonderful gift, perfect for the holidays. Priced at $16.95 Canadian one can get a copy by contacting Gina Noordhof at puffinchristmas@gmail.com. Books are also available at a number of local businesses on the tip of the Great Northern Peninsula. Visit http://www.valhalla-lodge.com/puffin.htm for more details on how to purchase, includes Free Shipping if mailed within Canada. It is wonderful to see such entrepreneurial activity being pursued right here to advanced the economy and experience of the Great Northern Peninsula and Newfoundland & Labrador. Many of our people are doing incredibly big things and sharing who we are with the world. Congratulations Gina and thank you for the copy! I wish you much success on your future endeavours and look forward to writing about more of our authors like Earl Pilgrim and Megan Coles in future posts. Posted on October 27, 2014, in Art, Business, Community Economic Development, Heritage, History, Landscapes/Geography, Tradition and tagged 12 days of christmas, author, book, gina noordhof, L'Anse aux Meadows, Newfoundland, tradition. Bookmark the permalink. Leave a comment.